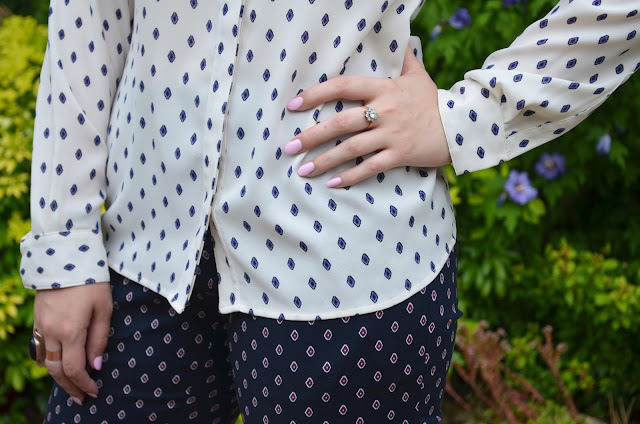 Shirt & Trousers : c/o Laura Ashley. 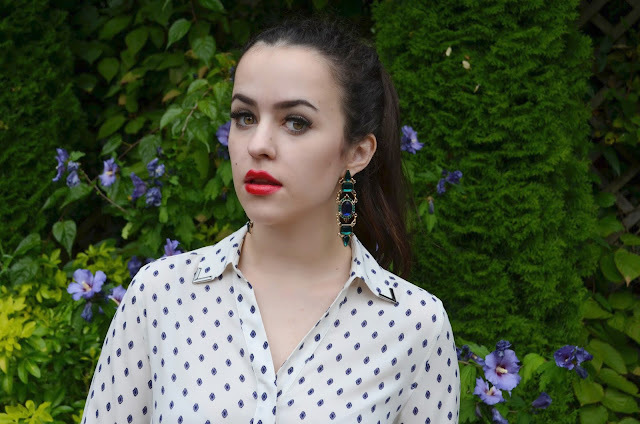 Earrings : ZARA. Shoes : Matalan (!!) Jacket : ASOS. Atrocious posture when seated : stylists own. Seeing as a large proportion of my bedroom is an homage to Laura Ashley interiors, I was rather excited when I was contacted by them asking if I'd style some of their fashion pieces. I've been really excited to photograph the items I chose for a kind of fun 'back to school / college' look - perhaps minus the heels for the purpose of getting to lectures on time. I paired the shirt and trousers together because they create something in-between clashing prints and co-ords, both of which I love. Although it's the same print in the sense that the shapes are identical, the colours are reversed, so I picked out the red within the diamonds on the trousers with some similarly coloured shoes, topping it off with an almost obnoxiously blue boucle jacket and some standard OTT earrings. On another note, this friday (so, tomorrow!) I'm curating and taking part in a Blogger Style Show at The Ashmolean Museum in Oxford for 'Dress Up! Live Friday at The Ashmolean'. As well as the show I'm organising (which will repeat 3 times throughout the night so you can't miss it!) there'll also be a runway show and an amazing couture-style exhibition with live fashion sketching, to name just a few of the highlights. Oh, and it's completely free to attend - so if any of you live in the Oxford area I would absolutely love to see some smiling faces tomorrow evening! You can see more about the event by clicking here. 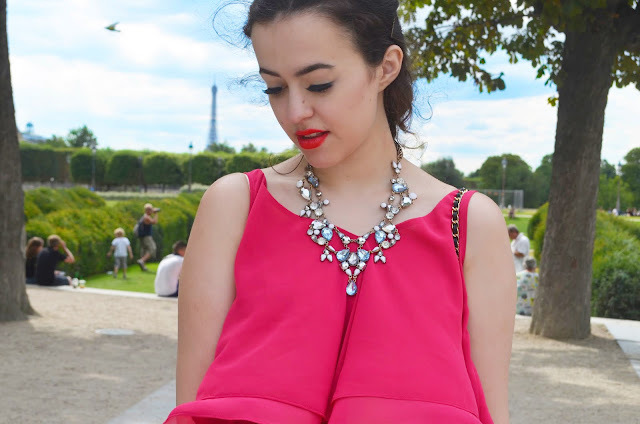 Here's another one of the outfits I wore on a scorchingly hot day in Paris. 'Wasn't your head too hot?!' I hear you ask. Well, the answer is yes, yes it was. Let's just say it reached the point where I could either allow my brain to cook or unleash severe hat hair. I actually opted for the brain cooking option in the end. As for the rest of the outfit, I wore this to walk along the Seine, have lunch (baguettes, of course) at a street cafe and then visit Notre Dame. 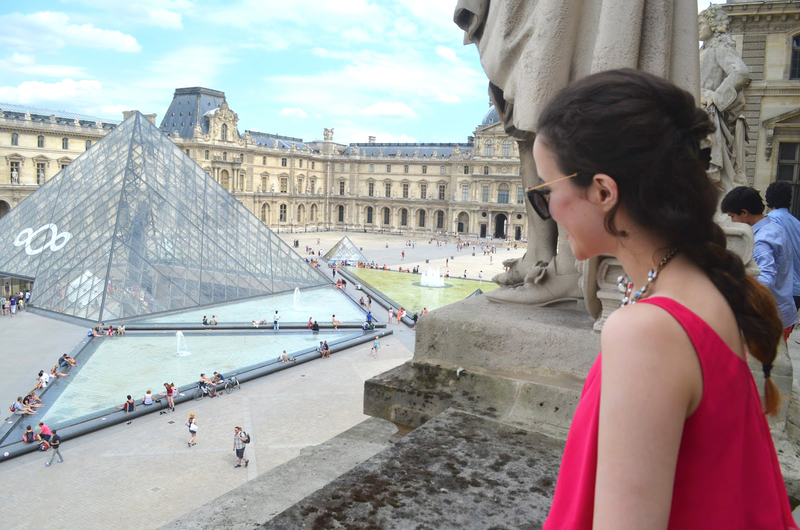 I felt I couldn't go to Paris without mixing my favourite pussybow blouse in there somewhere. It was definitely one of my less colourful looks, but I really liked the contrast between the black/white and red lipstick. I'm also semi-ashamed to admit that one of my Paris highlights was happening across THE bridge from the film Anastasia, where these outfit photos were taken. Please let me know if you recognise it/appreciate! If you scroll down to the 'holiday snap' type photos you'll see I've included a quite frankly unnecessary number of puppies-in-pet-shop pictures. I hope you enjoy / squirm with cuteness-overload. 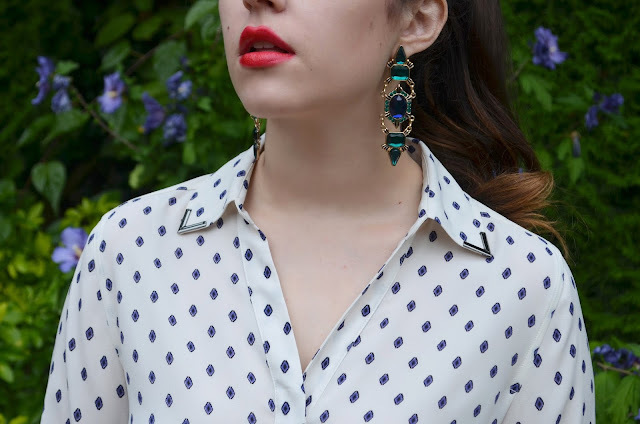 Blouse : c/o French Connection. Skirt & Belt : ASOS. Hat & Earrings : H&M. Bag : Vintage. Shoes : ZARA. Sunglasses : Miu Miu c/o Sunglasses Shop. 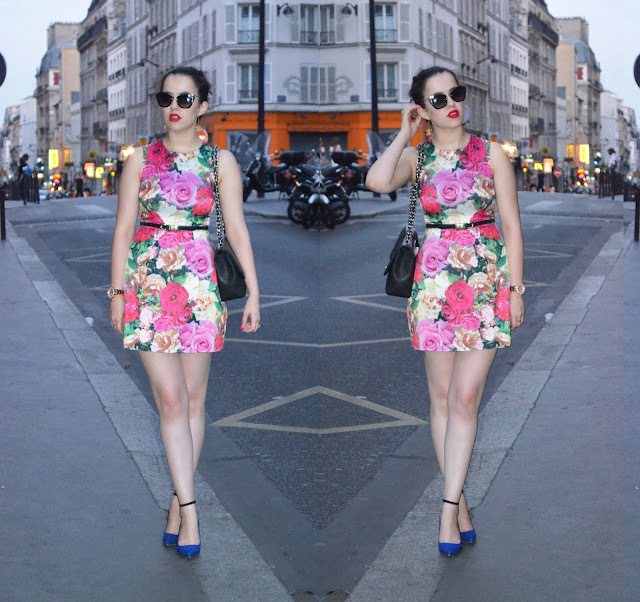 Tonight I'm sharing an outfit I wore in Paris to go out for dinner (if you can even categorise a dress as an outfit!) I'm a fan of bold prints and florals, so... you couldn't really combine those two things better than in this piece of clothing. I really love how it's so bold and striking but still remains feminine despite the fact that people often associate femininity with soft colours and shapes. This piece is pretty 'pow!' and relatively structured, but still girly and sweet at the same time, in my opinion anyway. The print is so detailed and the colours are beautifully vibrant. Every flower is perfect right down to the droplets of moisture on the petals, although I can't actually decide if it's a photographic print or if it's painted. What do you think? I'm leaning towards photographic. Dress & Belt : ASOS. Shoes : ZARA. 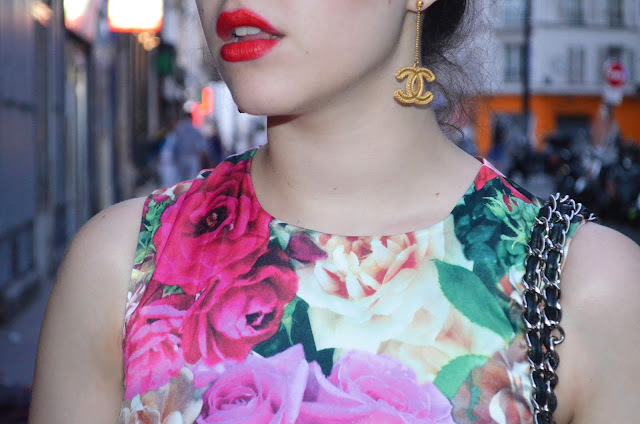 Bag & Earrings : Chanel. Sunglasses : Miu Miu c/o Sunglasses Shop. 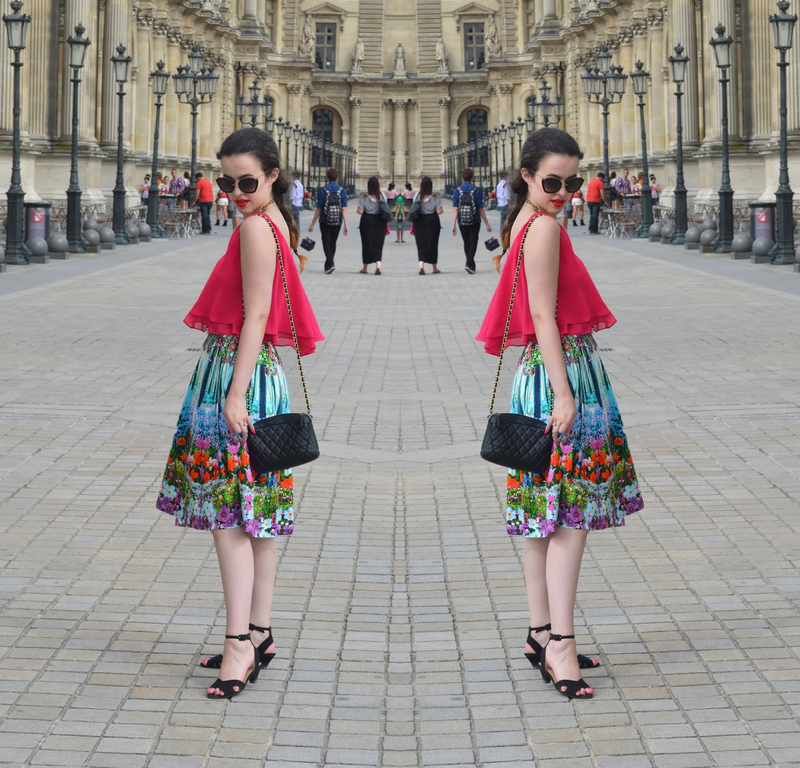 I'm back this evening with another one of the outfits I wore to visit The Louvre in Paris, continuing my love of midi skirts by adding this beautifully patterned (but at the same time slightly hideous?) piece to my ever growing collection. I can hear Regina George's voice echoing in my head 'that is the ugliest effing skirt I've ever seen.' I just adore the vibrant colours in this outfit; I don't know about you, but there are just some clothing combinations that make me feel really happy and positive - this is one of them! Paris is such an incredibly beautiful city and so I felt like this outfit was quite befitting for the colourful Jardin des Tuileries (which comes complete with its own goats. I was walking around and thinking, who designed this garden and then thought 'you know what this garden needs to make it perfect? Goats.') I also really enjoyed visiting The Louvre, although you might be able to tell that I was equally besotted with the ceiling design as I was with the artwork itself... but that's the point isn't it? The entire place is a work of art. Oh and also, if you'd like to laugh at me embarrassing myself by losing my car parking ticket and rolling all over the floor captured on film, now's your chance. Click here. Skirt : ASOS. Top : River Island. Necklace & Shoes : ZARA. Bag : Vintage. Sunglasses : Miu Miu c/o Sunglasses Shop. 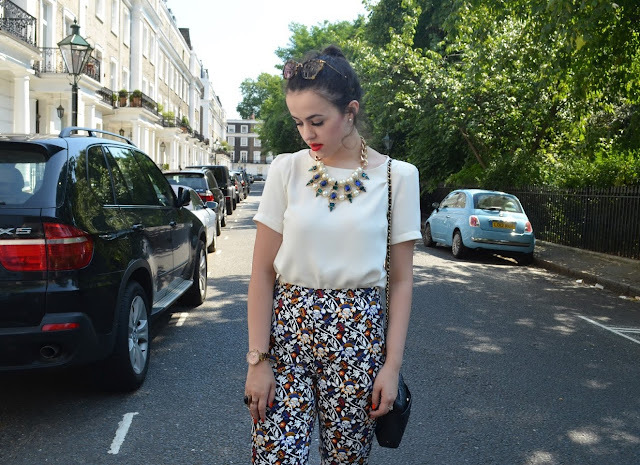 Paris outfit posts will resume shortly but I thought a little standard-Arabella intermission might do us some good. 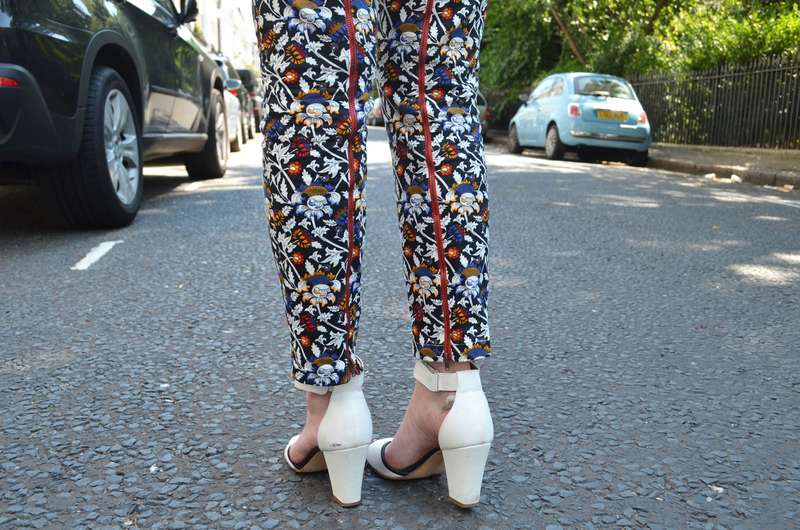 I don't always make my love of the printed trouser so obvious. Many a shopping trip I've fawned over a beautiful pair in Zara, Topshop and more, only to be disappointed upon pulling them on and finding they only rise to low-slung hip level. Trousers that cut off at the widest part of my hips are never flattering. Ever. So when doing my daily stalk check of the ASOS 'new in' section I happened upon these 'high waisted printed trousers' - high waisted! Hallelujah. I've never been so happy with a pair of trousers. They're comfy, perfectly cut, the colours are vivid and the William Morris style print is beautifully detailed. I've had them for around 4 days now and worn them 3 times... I think that speaks for itself. I wore this to visit the 'David Bowie is' exhibition at the V&A Museum in London (how is 'Ziggy-Red' not a lipstick shade yet?) which I would absolutely recommend you go to if you can / are interested! My mother has been a Bowie fan since the age of about 14 and so I've grown up hearing his music, as well as admiring his flamboyant style and general awesomeness. There's also a possibility that I fancy him a bit in The Labyrinth. 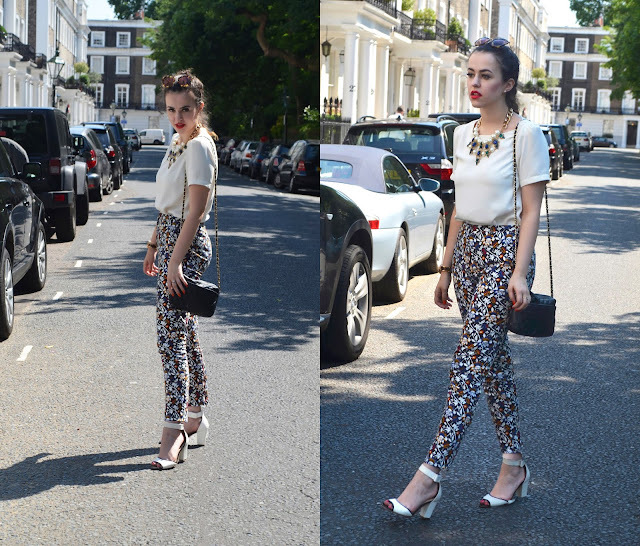 Trousers : ASOS. Top : Topshop. 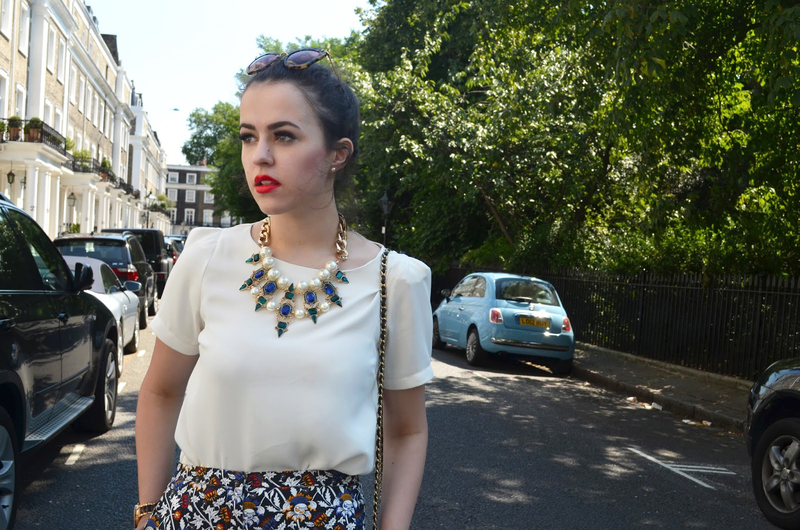 Necklace : ZARA. Shoes : Next. Bag : Vintage. Sunglasses : Miu Miu.